Last Saturday, evidence of the homeless camp that had sprung up on George Street beside the Queen Victoria Building was all but gone. Where there had once been numerous makeshift beds and furniture earlier in the week, there was only one lot of bedding laid out on the footpath. 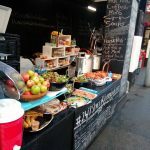 The sight of the rough sleepers spread out along the upmarket shopping precinct drew the ire of local business owners. 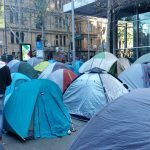 And people were raising concerns about whether the camp would continue to grow to the expanse of 2017 Martin Place Tent City. Early on 23 January, City of Sydney council officers and NSW police moved in and removed couches, piles of food and bags of clothing. And the few homeless people that remained after the raid, left later that evening once the construction crew working on the new light rail system arrived. Following days of the council and state government finger pointing at one another over responsibility, NSW social housing minister Pru Goward told 2GB last Wednesday that “the city council has worked with my department to fix this. All those furniture items… have been removed”. And what this episode revealed is that a year and a half after Tent City was dismantled there is still a very real crisis in homelessness in Sydney. And despite what might be officially said, those at the frontline assert that the numbers on the street are only growing. 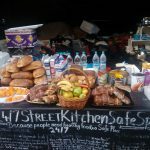 Lanz Priestley was the man behind the free street kitchen that was operating out of Martin Place Tent City. According to him, the removal of the QVB camp wasn’t the only homeless site to be cleared over recent days. He said that at least 22 sites around the city have been dismantled. 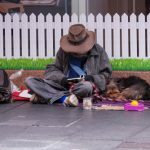 The unofficial mayor of Martin Place explained that the authorities “don’t particularly like homeless self-support groups, because ultimately”, they want these people engaging with government-backed programs and services. And advocates for homeless people also point out that when the government offers temporary accommodation without anything more permanent to follow up with, individuals will find themselves back out on the streets alone without the supports they’d built up prior to leaving. The next biannual City of Sydney street count will take place on 19 February. The last one was held in August and it found there were 278 people sleeping on the streets. This was a drop of over 100 people compared with the August 2017 count, which found there were 386 people sleeping rough. However, Mr Priestley makes clear that this isn’t the case. He put the disparity in figures down to a recent change in the timing the counts are being conducted. And he said he’d never before seen a third of the homeless attendees last Saturday at a weekly street kitchen held in Martin Place. 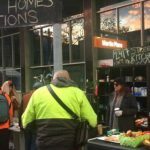 “We started asking around, and one of the common themes that’s presenting is people who have had their Centrelink cut off for six weeks as a penalty losing their usually private accommodation as a result,” the long-term homelessness activist said. Starting on 1 July last year, Centrelink’s new demerit system allows job agencies to cut off people’s payments for periods of time if they’re deemed to not appropriately be following compliance demands. What the housing minister failed to mention was when Tent City first established itself in December 2016, the NSW government didn’t have any powers to move the rough sleepers on. And it wasn’t until the Berejiklian government rushed through tailor-made legislation in August 2017 that it did. 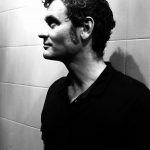 The bill provided police with move on powers to remedy “unlawful occupation” of Crown land, and “in particular, to deal with the unauthorised campsite in Martin Place”. And it was this move that forced those rough sleepers still present to leave before the police forcibly removed them. 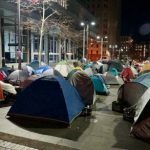 Back in June 2017, the city council tried to disband Tent City. At that time, NSW Housing came through with an offer of temporary housing moving into permanent for some of the rough sleepers. And Goward explained that today 94 percent of those people have maintained their tenancies. “She’s about right on that,” Mr Priestley agreed. “There has been a couple who have actually gone on to better things as well.” He added that one woman was able to start up a business while she was in social housing. And she’s since moved out and is paying for her own private accommodation. Ms Goward is also the NSW minister for family and community services (FACS). She further stated on the radio that there’s a FACS outreach team out on the streets that assertively offers assistance to the homeless. And she said this program is renowned around the world. “What she’s referring to is the temporary accommodation scheme,” Priestley explained. He added that the FACS scheme and delivery model were put in place back in 2010. And most of the time it has been shown to be ineffective.